"a delightful and charming family movie that successfully brings laughter and joy to the screen"
This is that time of the year in which new and old christmas movies get released to bring that magical spirit in everyone’s home. Among the many festive romances, Netflix is releasing a family movie to bring joy and laughter down the chimney this year. The plot is a mix of Elf meets Home Alone, creating a story filled with emotions as well hilarious moments of comic relief. Kate and Teddy Pierce (Darby Camp and Judah Lewis respectively) recently lost their father and, while usually every Christmas it was an excuse to be merry and celebrate, this year for the two siblings it feels extra empty without their dad. In an effort to spend more time with her brother, Kate decides to record Santa on tape bringing them gifts. Little does she know that one should always be careful for what they wish for. Their mission to show that Santa Claus exists becomes an expedition to save the Christmas Spirit all over the world and a chance to spend time with Saint Nic himself. Usually Christmas movies are made just to entertain and bring that warm feeling that only the holidays can give you. However, more often than not, they tend to lack in quality and execution. This is not the case for The Christmas Chronicles; with a brilliantly funny and charming Kurt Russell playing a sort of rock and roll and naughty Santa and a bunch of cute CGI elves, The Christmas Chronicles is a delightful and charming family movie that successfully brings laughter and joy to the screen. Like any holiday movie, everything is about protecting the Christmas Spirit and remind everyone that a little magic in life never hurts anybody. It highlights how important it is to be with your family, the only people that will always love you no matter how hard you try to push them away. 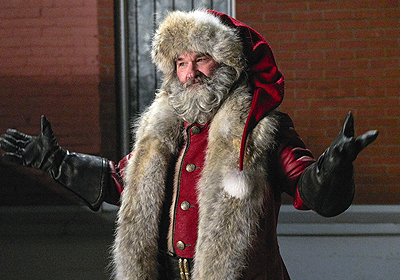 It doesn’t hurt that to deliver this message is Kurt Russell having fun playing a tougher and more in shape Santa who isn’t afraid to break the rules to save Christmas. Throughout the story, the audience gets to discover how Santa magically delivers his presents all over the world, as well as seeing him breaking his own rules to make sure that everyone receives what they wish for on time with the help of his elves and the two Pierce kids. With every successful ingredients to make the perfect Christmas movie, The Christmas Chronicles is the best Netflix film to let the holiday season in and enjoy this merry and bright time with family.